Vote wisely. Vote for change. Vote out the corrupted and habitual liar (you know who i mean). 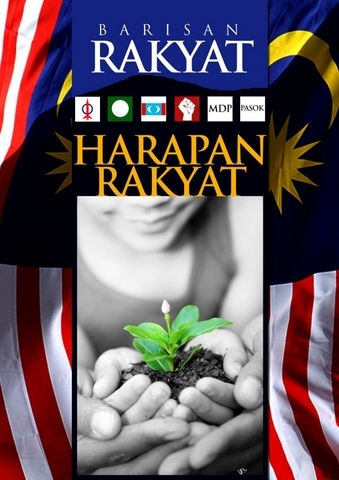 This entry was posted in Malaysia, Malaysian Concerns on February 26, 2008 by KF Chan. This is no fluke. The Cappuccino is just as good as the previous visit. If fact, I feel it is even slightly better than the previous one. Here’s the Flat White. Funnily, the Flat White is serve in a 6oz cup which is traditionally used for cappuccino. Cappuccino on the other hand is served in a 8oz cup. What you realise is that the terminology they use does not tell you anything. In fact, the Flat White is actually a real cappuccino without cocoa powder. Cappuccino standard use by the World Barista Championship is served in a 6oz cup with NO cocoa powder. How’s the Flat White? Good. Rating: 6.8/10. (I would give a 7 if the coffee is fresher). I have to admit, as of NOW, The Lawn serves the best coffee I’ve tried so far in a commercial settings in Malaysia. 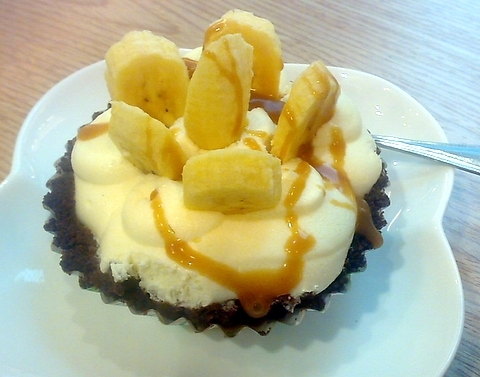 Here’s the Banoffee Pie. Very nice. I guess I always like dessert made with bananas. The Chicken Sandwich is decent too, though I find it expensive at RM 16.00. But it is a healthy piece of sandwich. The Lawn is now officially my favourite coffee outlet. Nuff said. This entry was posted in Cafe, Cappuccino, Coffee, Food, Malaysia, The Lawn on February 26, 2008 by KF Chan. I’m in KLCC now waiting for my wife. Sent her to some “Music Appreciation” session at Philharmonic. So, I dropped by this place… The Lawn, level 2. The food here all look nice and healthy. It’s name “The Lawn” tells you that many things come in the colour green. Wow! It is nice. They sprinkle some chocolate powder on to the coffee before pouring in the milk. The milk was nicely frothed and retained its natural sweetness. This is by far one of the best cappuccino I’ve tried in a Malaysia cafe. Another surprising note is that they are using beans from Coffex. Obviously, with the higher traffic of customers in KLCC, the coffee beans does not sit long in the grinder and waiting to get stale. The end-result = better tasting coffee. With the price of RM7.00, it is by far the better tasting coffee and best value for money in town. Forgot to mentioned earlier, the extraction of the espresso is not so good. It was fast and watery. This is one very common mistake among cafes. The grind is not adjusted fine enough. Most of the time, I don’t see the espresso flowing down mousetail-like or flowing down like hot honey. 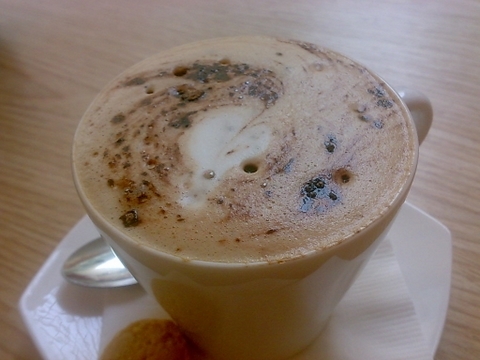 This entry was posted in Cafe, Cappuccino, Coffee, Coffex, espresso, Malaysia, The Lawn on February 17, 2008 by KF Chan. If you want to make nice coffee at home that is hassle-free and affordable, there is nothing better than the Aeropress. Do not be misled by the advertisement on the website. It does not make Espresso. In fact, it does not come anywhere close to even taste like espresso. 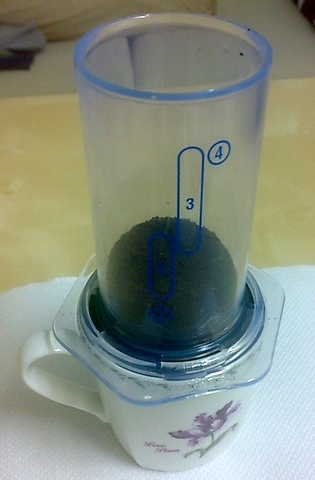 In fact the Aeropress way of brewing coffee is an entirely different way of making coffee. It is not a french press and it is not drip, even though you need to press and there is a filter used. I bought mine online from Australia for about RM 200.00. You may think it is expensive but it is made of durable plastic and it will last for years. What you are paying is a great idea, designed to be super-convenient, portable and make a very decent cup of coffee. It is by far the easiest and most mess-free way of making coffee (not counting instant coffee, ok). Here are the basic setup. 1. The tube on top left is where the coffee ground goes to. 2. 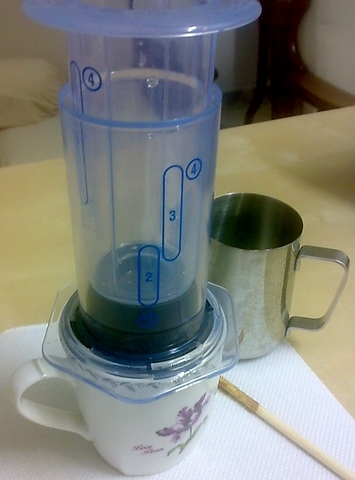 The tube on top right is the device used to press down and extract the coffee. 3. Bottom left is the cap to screw onto item 1. 4. 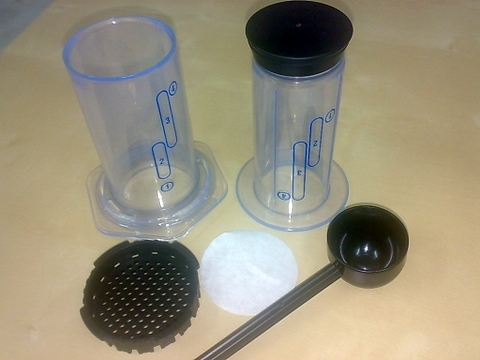 The paper filter and scoop. The paper filter is put inside the cap and this is how it looks like after screwing up the cap. I put into the tube about 20g of coffee, and set it on top of a mug. I pour in about 4oz of hot water about 92 degree celsius and i use a wooden chopstick to stir it. You can use the stirrer that comes with it, of course. Wet the black plastic and insert the second tube. Then press down gently. There you have it. 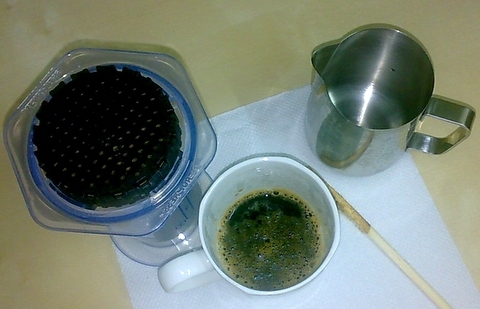 The concentrated result from the Aeropress. Now just pour in more hot water and dilute it to your liking. 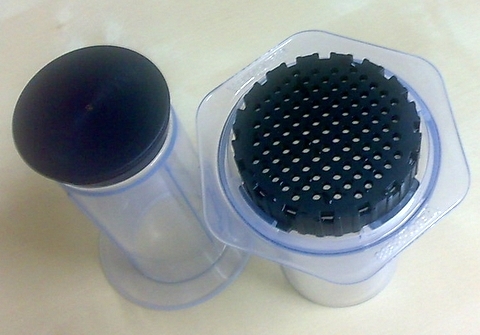 To clean up, unscrew and remove the cap, pressing further will dislodge the coffee puck. Rinse and it is over. Totally no mess. It is smooth and clean. There is almost no fines or sludge unlike coffee from the french press. And it is fast. I think it take only 3 minutes including washing up the Aeropress. Add your sugar or milk or creamer to taste. When you have fresh and quality coffee, do like I do. I drink it Kopi-O, sugar-free. It’s great. 1. The quality of your coffee beans and the freshness of it. 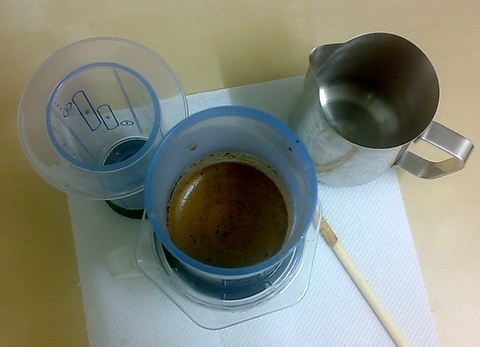 This entry was posted in Aeropress on February 16, 2008 by KF Chan. As recommended by Anuar, I went to Glitters Cafe at the Pavilion. It is on the 5th Floor, next to GSC snacks counter. Thanks to Anuar’s tip, I asked them about the promotion. They asked if I had the voucher. Told them a friend recommend me to try their coffee. I said I will have lunch there and wanted to try their promotional coffee. So they agreed to offer me the RM1.00 Cappuccino promotion. I had a nasi lemak there and it cost RM15.00. Got potential the nasi lemak. Came with all the usual stuff plus Curry Chicken and Sambal Prawns. The Sambal Prawn was quite nice, peanuts and ikan bilis was crunchy. Unfortunately the letdown was the Curry Chicken. The curry tasted not bad… but the chicken left a bad taste in my mouth. I think it was bordering on going bad. I wouldn’t write them of just this time because I do understand that sometimes food operator receive some questionable batch of food from the supplier and not know about it. I complain to the manager and got a 20% discount. Do note that it has not really gone totally bad but bordering on the end of the cycle. I was pleasantly surprise. Very nice latte art. Once of the best I’ve seen in a Malaysia Cafe. The milk was decently frothed. The manager told me that the owner is an Australian and demands that all his barista must be able to do latte art. As you can see from the cup, their coffee is from Coffex. I think the size of the cup is either 6 or 7oz. Perfect for cappuccino. How was the taste? Slightly disappointed. Not much natural sweetness in the cup. They are using Farmhouse Full Cream milk (the best in Malaysia). So, can’t be the milk unless they are re-frothing the milk. Didn’t manage to confirm that. (next time I must stand there and watch). But I suspect the culprit is the coffee. Coffex coffee are not exactly fresh, but I’m sure they cannot be much worse than Starbucks or Illy. So I think the problem is oxidized beans. You will notice that Glitters Cafe is not having a lots of traffic. Certainly most Starbucks has higher traffic. Now, when your coffee is not moving fast, and you dump 500g into the grinder hopper, you are basically exposing the coffee beans to oxidation from the air. If the unused coffee beans were left there overnight, they will be staled. That was unfortunate. But still, I give them credit for the effort in learning how to properly froth milk and doing latte art. If they can get more customers, the faster moving coffee beans will definitely taste better. I wouldn’t write them off. In fact given the opportunity, I go and try again. I got my coffee at RM1.00. Not the RM10.00 from Espressamente. Normal price would be RM7.00. Do go and give them a try. 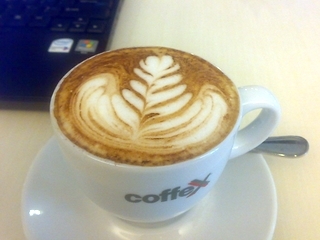 This entry was posted in Cafe, Cappuccino, Coffee, Coffex, Malaysia on February 16, 2008 by KF Chan. Drop by Espressamente today. This is a store of everything Illy. Illy’s home espresso machine (Francis! Francis! ), Illy coffee beans in cans, Illy Coffee cups and big Illy logo everywhere. Location: 3rd Floor, The Pavilion. The front entrance faces towards KL Plaza. The display of beverages were nicely done. In fact they look so good, I really felt like trying them all. Presentation is impressive. But alas, the coffee is average at best. I would rather go to Gloria Jeans. As you will notice, there are some attempt to create microfoamed milk. (They call it emulsified milk), but the milk were not really velvety smooth. Still lots of small (small but still very visible) bubbles. Well, still better effort than most Starbucks. 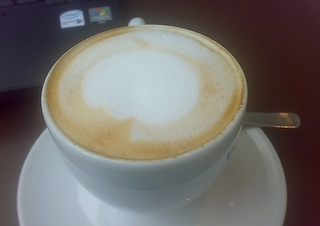 One thing that is almost always consistent with places that uses Illy beans is that the beans lack freshness. How do I know? 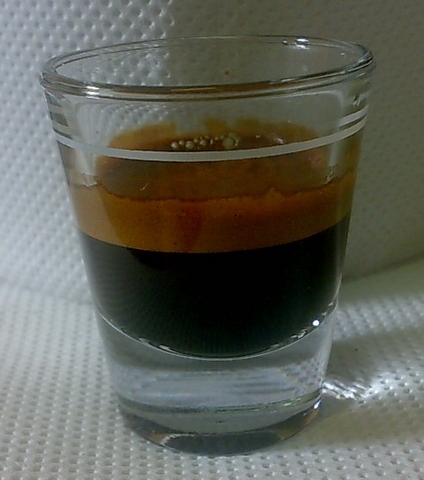 Credit to them, when the espresso is extracted, it does look promising from afar. Small stream of mouse-tail-like espresso pouring out. Extracting time is about 20 to 25 secs, I estimated. But the result in the shot glass is apparent. THE LACK OF CREAMA. You don’t see a lots of crema in Starbucks because most of the time, their espresso extraction is less than 20 secs, in fact from my personal observation, most of the time it is less than 18 secs. 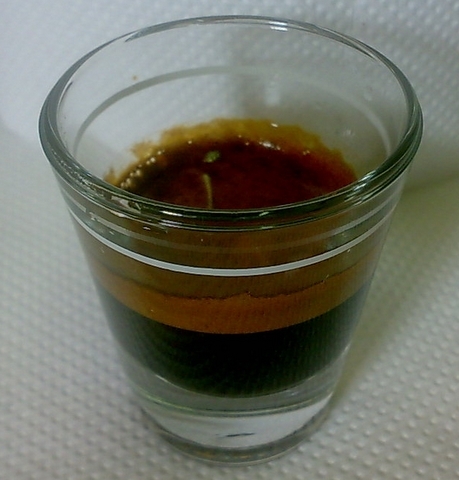 They can harldy get the extraction timing correct, how in the world to get nice crema. Especially most beans in Starbucks is OLD. Another thing that really bug me is that they re-froth their milk. No wonder the microfoam is not well done and most of the natural sweetness is missing. Why am I being so critical. 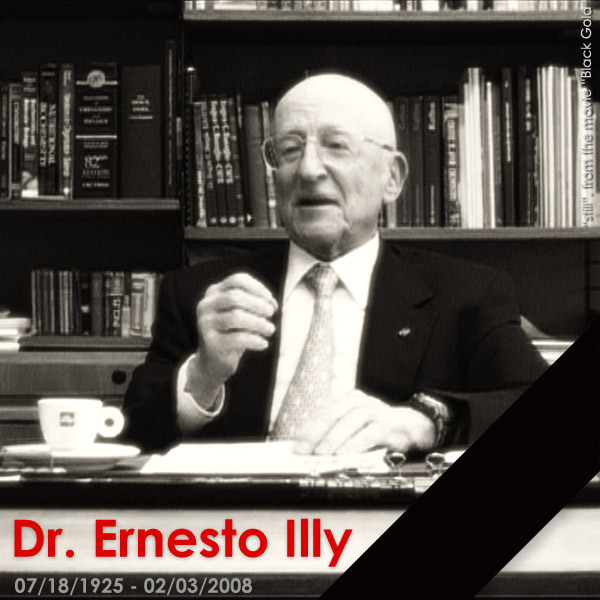 Dr Ernesto Illy, the second generation of the Illy family, and an absolute giant in the world of espresso and coffee research and science – has just passed away on the 3rd Feb 2008. 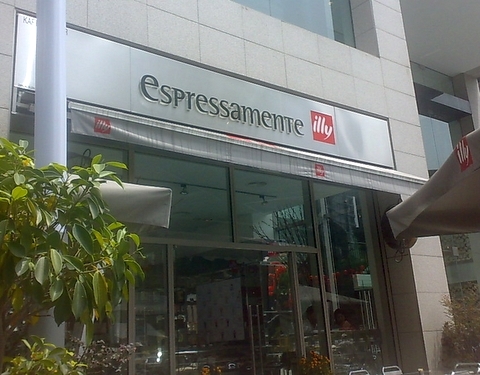 Using the Illy brand, they owned it to the Illy family to do a good job. Especially if you want to charge premium price for a cup of coffee. My 7oz of cappuccino (smaller than Starbucks and Gloria Jeans) cost RM 10.00. Add in 5% tax + 10% service charge, a whopping RM 11.50. Good presentation, nice design, average coffee and ridiculous price. Note: All comments are purely my own opinion and preferences. Feel free to go and try. It is your money. Last thought: There are many cafes out there. Most serve an average cup of coffee. I don’t really want to complain too much. They did charge an average price for an average coffee. But when you charge even higher than Starbucks for a smaller cup of coffee, get your act right lah. Re-frothing milk??? Dirty portafiler??? Never dry the portafilter before dosing??? Arrrgghhh.. Final good thought: The Illy cups are great. In fact they are among the best. Thick and nicely design. Not cheap but definitely very nice cups. I will go back and buy their cups for sure. This entry was posted in Cafe, Cappuccino, Coffee, Espressamente, espresso, Gloria Jeans, KL, Kuala Lumpur, Malaysia, Starbucks and tagged KL, Kuala Lumpur on February 12, 2008 by KF Chan. On the first day of Chinese New Year 2008, the year of the Rat. I wish all readers a year as good as good coffee can be… Rich, Warm, Fresh, Lively and enhanced the productivity of our nation. 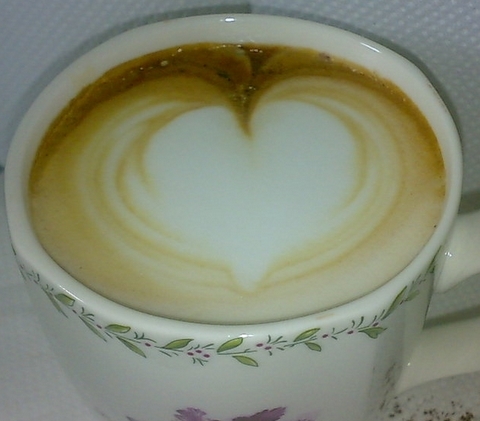 Do fill your heart with love whenever you enjoy a cup of coffee and make this world a better place. 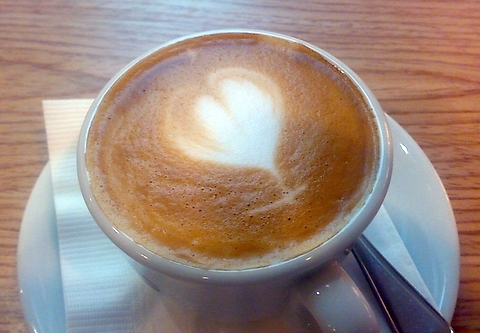 This entry was posted in Cappuccino, Coffee, espresso, Malaysia on February 7, 2008 by KF Chan.